“This exquisite little butterfly is one of the many delights of the south” wrote Scudder in 1899. At that time it was found mainly from West Virginia and Kentucky southward, and westward to the Great Plains. Like the White M Hairstreak it was “not found in New England” (1899: 1822). Today, Red-banded Hairstreak has moved into southern New England. It is a regular fall visitor and probable over-wintering resident in Connecticut and Rhode Island. It was first found in Massachusetts in 2011, as demonstrated by the photo at right. Sightings in 2012 and 2013 showed an expanding range in the state. No historical Massachusetts records exist. Since 1900, Red-banded Hairsteak has extended its range dramatically northward. In New Jersey it was very rare and irregular (one record) prior to 1940, but by 2000 it had become almost common in some areas and in some years (Gochfeld and Burger 1997: 162-3). In New York it was known only from Long Island in the 1970’s (Shapiro 1974; Klots 1951). Paul Opler’s mid-1980’s range maps show the northern edge of this species’ range as including only part of New Jersey and Long Island (Opler and Krizek 1984). But by the mid-1990’s Red-banded Hairstreak had reached Rhode Island, where one was found by H. Pavulaan at Pawtucket in 1995, and southern coastal Connecticut, where the 1995-1999 Atlas located 9 pre-project records. It probably migrated to these states from nearby Long Island. The species is still ranked as “rare” in Rhode Island (RINHS Checklist 2007), but growing numbers are being seen. In Connecticut sightings of both the spring and fall broods are likewise becoming increasingly common (Brown, Field Notes 2002-2012). It is likely that Red-banded Hairstreak successfully overwinters in Connecticut and Rhode Island, at least in the warmer parts. As Harry Pavulaan puts it, "There is no way such tiny little mites can repopulate such a broad area each summer" from Long Island or New York city (pers. comm. 9/2/2013). Lenny Brown, keeper of Field Notes for the Connecticut Butterfly Association, believes that Red-banded Hairstreak is now a full-year resident in the southwestern section and as far east as coastal Guilford (L. Brown, pers. comm. 8/30/2013). However, especially cold winters probably reduce the overwintering populations in these states, and in fact spring (first brood) sightings in both Connecticut and Rhode Island have been somewhat sparse and unpredictable. Connecticut butterfly observers have seen a first or spring brood in May or June in 2006, 2009, 2011 and 2012. Fall sightings have been regular every year since 2006, with especially good numbers in 2006, 2007, 2008, 2011, 2012 and 2013. Fall sightings are more numerous and more widely distributed than spring sightings (Brown, Field Notes, www.ctbutterflies.org ; pers. comm. 8/30/2013). In Rhode Island, as of 2005, there had been at least one June sighting (Pavulaan 2005). In 2012 and 2013, there were also spring reports (5/19/2012, Westerly, M. Arey; and 6/22/2013, Providence Roger William Park, M. Keiron, photo). As in Connecticut, in all years since 2005 there have been fall sightings, more numerous than spring sightings. An especially large number were seen in fall 2013. Winged or dwarf sumac (Rhus copallinum) is the host plant most reported in our area -- e.g. Long Island (Shapiro 1974) and Rhode Island (Pavulaan). In West Virginia, staghorn sumac (Rhus typhina) (=hirta) is reported in addition to winged sumac (Allen 1997). The Connecticut Atlas also reported use of staghorn sumac, but did not indicate that larvae had actually been found on this plant in the wild. Both sumacs are native to and found in all counties in Massachusetts (Dow Cullina et al. 2011). Other sumacs are mentioned in the literature, as well as other plant species further south. But it is highly likely that Red-banded Hairstreak is in fact a detritus feeder, and does not need fresh leaves for caterpillar growth. Those who have raised it under artificial conditions find that eggs are laid on, and larvae eat, only rotted leaves of various species, especially old or rotting lettuce (e.g. Pavulaan, pers. com. 9/3/2013). So whether Red-banded Hairstreak actually uses sumac as a host plant, or perhaps is found around it only as a nectar source, is still uncertain. Nectar sources include sumac, wild cherry, dogbane, blackberry, milkweeds, New Jersey tea, yarrow, and others (Allen 1997; Opler and Krizek 1984; Pavulaan). The butterfly is reported attracted to small, white flowers. It has been photographed or reported in Massachusetts on flowers of sedum, joe-pye weed, clethra, and mint. Red-banded Hairstreaks are found in semi-open areas such as brushy fields, forest edges, abandoned farms, hedgerows, and power lines. In these habitats, they are often, but not always, found near sumac. However, they have also been found in forests: Harry Pavulaan found them in North Carolina in a shady red maple forest, with no understory, just a lot of decaying leaf mold, on which the butterflies were laying eggs. He has also seen ovipositing on shredded hardwood mulch under shrubs in his Virginia garden (Pavulaan, pers. com. 9/3/2013). Red-banded Hairstreak has been seen every year since first reported in 2011, but as of 2013 it is still a rarity. The number of sightings increased each year: three were reported in 2011, four in 2012, and nine in 2013. Sightings have always been of single individuals. Observers called 2013 a "mini-invasion." 2011: 8/3/2011 Dartmouth, Gooseberry Neck, 1, Bob Bowker; 8/20/2011 Longmeadow, Fannie Stebbins WS, 1, Tom Gagnon, Bo Zaremba and others, see photo above; 8/23/2011 Dartmouth Allens Pond Field Station, Brian Cassie. 2012: 8/18/2012 Northampton Community Gardens, 1, Tom Gagnon; 8/28/2012 Northampton Community Gardens, 1, Tom Gagnon; 9/6/2012 East Longmeadow yard, 1, schmerv24 BAMONA photoreport; 9/14/2012 Paxton, Moore State Park, E. and K. Barry, photographed. 2013: 8/4/2013 Mattapoisett Nasketucket Bay SR, 1, M. Arey; 8/7/2013 Dartmouth Slocums River Reserve, 1, M. Mello; 8/10/2013 Dartmouth Allens Pond, 1, L. Miller-Donnelly; 8/16/2013 Dartmouth Allens Pond, 1, L. Miller-Donnelly, prob. same individual as 8/10; 8/16/2013 Marshfield Daniel Webster WS, 1, D. Ludlow, photographed; 8/18/2013 Mattapoisett Nasketucket Bay SR, 1, M. Arey and A. Grkovich; 8/20/2013 Foxboro power line, 1, Madeline Champagne, photographed; 8/24/2013 Norton power line, 1, Brian Cassie; 9/9/2013 Dennis Crowe's Pasture, 1, Joe Dwelly; 9/19/2013 Dartmouth Allens Pond, 1, L. Miller-Donnelly and others; 9/23/2013 Dartmouth Slocum River Reserve, K. Keegan fide M. Mello. As of 2013, Red-banded Hairstreak has been seen in 10 out of 351 Massachusetts towns (see list above). All sightings have been in either southeastern Massachusetts (north to Foxboro and Marshfield) or the Connecticut River valley (north to Northampton), except for one photo-documented sighting in the central part of the state near Worcester (Paxton). 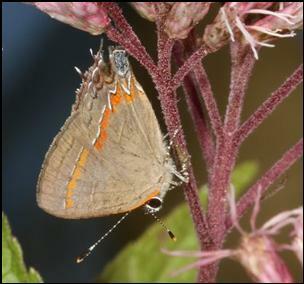 Red-banded Hairstreak is thought to have two generations in the mid-Atlantic states. For example in New Jersey the flight times are late May-June, and August-October (Gochfeld and Burger 1997). Brood timing appears similar for Connecticut, with spring sightings in May and June (as early as 4/29 in 2012), fall sightings in August and September. However in many southeastern states (for example, West Virginia: Allen 1997), this species has three broods, and more in south Florida. Brood timing is still unclear in Massachusetts, since all Massachusetts sightings have been in August or September. These fliers are probably immigrants from further south, but could possibly be the result of an over-wintered spring brood which has not yet been observed. The earliest sighting in Massachusetts so far is 8/3/2011(Westport Gooseberry Neck, B. Bowker); the latest is 9/23/2013 (Dartmouth Slocum River Reserve, K. Keegan fide M. Mello). We await spring sightings. Red-banded Hairstreak has been extending its range northward for the last century, probably in response to climate warming. Thus, as with White M Hairstreak, we would expect to see more of this alluring southern butterfly. It is listed on Table 6 as among those species likely to increase in Massachusetts due to climate change.